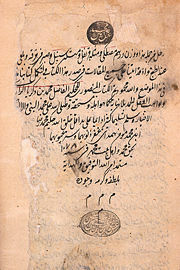 Abū Bakr Muhammad ibn Zakarīya al-Rāzi (Arabic: ابو بکر محمد بن زكريا الرازی; Persian: زكريای رازی Zakaria ye Razi; Latin: Rhazes or Rasis). According to al-Biruni he was born in Rayy, Iran in the year 865 C.E. (251 a.h.), and died there in 925 C.E. (313 a.h.). Al-Razi was a Persian physician, philosopher, alchemist, and scholar who produced over 200 books and articles in various fields of science. He was well versed in Greek medical knowledge and added substantially to it from his own observations. As an alchemist, Razi is credited with the studies of sulfuric acid, the "work horse" of modern chemistry and chemical engineering. He also wrote about ethanol and its refinement and use in medicine. His philosophical writings had an impact on the thinkers of the Islamic world, and his medical and scientific texts, translated into Latin and later into other languages, were widely read throughout Europe. The modern-day Razi Institute in Tehran, and Razi University in Kermanshah, were named after him, and "Razi Day" ("Pharmacy Day") is commemorated in Iran every August 27th. Razi's portrait adorns the great hall of the Faculty of Medicine in the University of Paris. According to the mathematician al-Biruni, Abū Bakr Muhammad ibn Zakarīya al-Rāzi was born in Rayy, Iran in the year 865 C.E. In Persian, Razi means "from the city of Rayy" (also spelled RAY, REY, or RAI, old Persian RAGHA, Latin RHAGAE), an ancient town on the southern slopes of the Elburz Range that skirts the south of the Caspian Sea, situated near Tehran, Iran. In this city (like Avicenna) al-Razi produced much of his work. In his early life he may have been a jeweler, a money-changer, or a lute-player who changed his interest from music to alchemy. Around the age of thirty or forty he stopped his study of alchemy because conducting experiments caused an eye disease which required medical treatment; some say this was why he began his medical studies. He apparently began to study medicine after his first visit to Baghdad, with 'Ali ibn Sahl Rabban al-Tabari (808–855 C.E. ), a Jewish convert to Islam and a physician and philosopher belonging to the famous medical school of Tabaristan, or Hyrcania. The scholar Ibn al-Nadim (d. 995) indicates that al-Rasi studied philosophy under a teacher named al-Balkhi, a pupil of Hunayn Ibn Ishaq who had traveled widely and possessed great knowledge of philosophy and the ancient Greek, Persian, and Indian systems of medicine. Al-Razi surpassed his master and became famous in his native city as a physician and a teacher. During the reign of Mansur ibn Ishaq ibn Ahmad ibn Asad (Governor of Rayy from 902–908), he was appointed director of the hospital at Rayy. Al-Razi moved from Rayy to Baghdad during Caliph Muktafi's reign (approx. 901–907), where he was head of the famous Muqtadari Hospital. He also served as physician at the Samanid court. One story relates that he determined the location for a new hospital in Baghdad by leaving pieces of meat in various quarters of the city and selecting the site where the meat rotted most slowly. After al-Muktafi's death in 907, al-Razi allegedly returned to Rayy and gathered many students around him. According to Ibn al-Nadim in Fihrist, al-Razi was then a Shaikh (a title given to one entitled to teach) "with a big head similar to a sack," surrounded by several circles of students. When someone arrived with a scientific question, this question was passed on to students of the "first circle." If they did not know the answer, it was passed on to those of the "second circle," and so on, until at last, when all others had failed to supply an answer, the question came to al-Razi himself. Al-Razi was said to be a generous man, who behaved humanely towards his patients, and treated the poor free of charge. When he was not occupied with pupils or patients he was said to always be writing or studying. He produced over one hundred works on medicine alone, and another hundred on alchemy, chemistry, psychology, and philosophy. Al-Rasi’s sight became weaker; he developed cataracts and finally became blind in both eyes. Some say the cause of his blindness was that he used to eat too many broad beans (baqilah). A legend says that he refused to be treated for cataracts, declaring that he "had seen so much of the world that he was tired of it." One of his pupils from Tabaristan came to look after him, but, according to al-Biruni, he refused to be treated, saying it was useless as his hour of death was approaching. Some days later he died in Rayy, on October 27, 925 (5th of Sha'ban 313). Because of the prominence of his medical works, Al-Razi is remembered in the West primarily as a physician, although his philosophical works triggered a barrage of criticism from other Muslim scholars and theologians. In both medicine and philosophy, he emphasized the use of reason, careful observation, and a well-ordered methodology. He produced more than two hundred works, half of which were on medicine. He also wrote twenty-one books on alchemy and helped to prepare the foundations of modern chemistry. His works on mathematics, astronomy, physics, and optics have been lost, but about forty of his manuscripts are extant in museums and libraries in Iran, Paris, Britain, Rampur, and Bankipur. A number of his medical works were translated into Latin and European languages, and used as textbooks for several centuries. Al-Razi was considered a foremost authority on medicine through the seventeenth century. Al-Razi was known in Europe by his Latinized name, Rhazes. Book of Medicine Dedicated to Mansur (Kitab al- Mansoori), a short general textbook on medicine with ten chapters (dedicated in 903 C.E. to the Samanid prince Abu Salih al-Mansur ibn Ishaq, Governor of Rayy), was translated into Latin during the twelfth century by Gerard of Cremona as Liber ad Almansoris. It became one of the most widely read medieval medical manuals in Europe. The ninth chapter was frequently published by itself as Liber nonus ad Almansorem, and many editions of it included commentaries by prominent Renaissance physicians, such as Andreas Vesalius. His Comprehensive Book on Medicine, the Hawi, was translated into Latin in 1279 under the title Continens Liber by Faraj ben Salim, a physician of Sicilian-Jewish origin employed by Charles of Anjou to translate medical works. Al-Judari wa al-Hasbah, containing a celebrated monograph on smallpox and chickenpox, was published in forty editions between 1498 and 1866. It was first translated into Latin in 1565, and appeared more than a dozen times in various European languages. Several other of al-Razi’s books, including Jami-fi-al-Tib, al-Malooki, Maqalah fi al- Hasat fi Kuli wa al-Mathana, Kitab al-Qalb, Kitab al-Mafasil, Kitab-al- 'Ilaj al-Ghoraba, Bar al-Sa'ah, and al-Taqseem wa al-Takhsir, also circulated in medieval Europe. Al-Razi relied on clinical observation, and was more concerned with remedies and treatments than with detailed classification of the symptoms of illnesses. He favored curing disease through diet and nutrition before resorting to medicines. He tested proposed remedies on animals in order to evaluate their effects before using them on humans. He was an expert surgeon and the first to report the use of opium as an anesthesia, and to introduce the use of alcohol (Arabic: al-kuhl) for medical purposes. His books contain the earliest description of an operation to remove cataracts from the eyes, and he was the first to discuss the widening and narrowing of the pupil by small muscles in the eye which respond to the intensity of light. He also gave elaborate descriptions of the intervertebral foramina and the spinal chord, and correctly asserted that an injury either to the brain or spinal chord would lead to paralysis of the parts of the organs whose nerve supply was damaged or destroyed. Al-Razi warned that even highly educated doctors could not heal every disease. He made a distinction between curable and incurable diseases, and commented that the physician should not be blamed when he could not cure advanced cases of cancer and leprosy. Al-Razi advised practitioners to keep up with advanced knowledge by continually studying medical books and exposing themselves to new information. Al-Razi's Kitab fi al-jadari wa-al-hasbah (Book on Smallpox and Measles), was twice translated into Latin during the eighteenth century. An Article on the Reason Why Abou Zayd Balkhi Suffers from Swelling of the Head When Smelling Roses in Spring, in his book, Sense of Smelling, discusses seasonal "rhinitis," or hay fever. Razi was the first to recognize that fever is a natural defense mechanism of the body when fighting a disease. He wrote Man la Yahduruhu Tab as a medical manual for the general public, dedicated to the poor, the traveler, and the ordinary citizen who could consult it for treatment of common ailments when a doctor was not available. In its 36 chapters, al-Razi described diets and remedies that could be found in a kitchen, market, or military camp and gave instructions for their preparation and use. In Doubts about Galen (Shukuk 'ala alinusor), al-Razi challenged the fundamental principles of contemporary medicine, which were based on the theories of Galen. He criticized Galen's theory that the body possessed four separate "humors" (liquid substances), whose balance was the key to health and a natural body temperature. He reported that his own clinical observations did not support Galen’s descriptions of fever. Following the ideas of Aristotle, al-Razi rejected the mind-body dichotomy and emphasized the importance of a sound mind and a positive mental attitude to good physical health. He told physicians to bolster their patients’ determination to resist illness and make a speedy recovery. Al-Razi linked the practice of medicine with philosophy, saying that a good physician must be an independent thinker. His criticisms of Galen drew accusations of arrogance and ignorance from other physicians, but al-Razi stated that he simply wished to correct what was erroneous. Shortly after the death of al-Razi, Ibn al-`Amid, a statesman and scholar, purchased from al-Razi's sister the notes comprising the Hawi, or Comprehensive Book, and arranged for some of al-Razi’s students to put them in order. It was a large commonplace book, representing fifteen years of writing, in which al-Razi had collected extracts from earlier authors regarding diseases and therapy and also recorded clinical cases of his own experience. The material was arranged under the names of different diseases and pharmacological topics, and contained all the important information available from Greek and Arab sources, followed by his own comments and conclusions. The Hawi preserved fragments of early Greek, Arabic, and Indian medical works which are now lost, and presented a wide variety of clinical descriptions. The twenty volumes of Al-Hawi may be the largest medical work ever written by a single author, and were responsible for al-Razi’s reputation as the foremost medical authority of the Middle Ages. The work contained his views on Aristotle and Plato, and expressed innovative opinions on many subjects. It was first translated into Latin during the thirteenth century and had considerable influence on medicine in medieval Europe. Al-Razi took a serious interest in chemistry and in the preparation of medicines, and is sometimes referred to as the father of modern pharmacology. He introduced the use of "mercurial ointments" and developed apparatus such as mortars, flasks, spatulas, and phials, which were used in pharmacies until the early twentieth century. He also produced alcohol by fermentation of sweet substances, and used it in the formulation of medicines. Al-Razi challenged Aristotle’s theory of the Four Elements (fire, water, earth, and air), saying that his own experiments suggested other qualities of matter, such as salinity, oiliness, and sulfurousness, or inflammability, which were not readily explained by the traditional division of elements into those four categories. He dismissed the idea of potions and reliance on magic symbols, although he did not reject the idea that miracles exist in the sense of unexplained phenomena in nature. In exploring causality, he relied predominantly on the Neoplatonic concept of "dominant" forms or essences, rather than on intellect or a mechanistic view of the cosmos. He is known to have perfected methods of distillation and extraction, which contributed to his studies of sulfuric acid (by dry distillation of vitriol, al-zajat), and alcohol. These studies paved the way for other Islamic alchemists. His books presented a systematic classification of carefully observed and verified facts regarding chemical substances, reactions, and apparatus, described in a language almost entirely free from mysticism and ambiguity. Al-Razi's two best-known alchemical texts, which largely superseded his earlier ones, were al-Asrar (The Secrets), and Sirr al-Asrar (The Secret of Secrets). Kitab-al-Asrar (Book of Secrets), written in response to a request from Razi's friend and former student, Abu Mohammed ben Yunis, classified substances into plants, animals, and minerals, laying a foundation for inorganic and organic chemistry. Sirr al-Asrar (The Secret of Secrets) identified the drug components of plant, animal, and mineral substances and the best type of each for utilization in treatment. It also listed the equipment and tools needed by either an alchemist or apothecary, and described seven alchemical procedures and techniques: Sublimation and condensation of mercury; precipitation of sulfur and arsenic; calcination of minerals (gold, silver, copper, lead, and iron); salts; glass; production of talc from animal shells; and waxing. He also described the use of solvents and heat, and identified which stones contained mineral ores and salts. His alchemical stockroom contained the products of Persian mining and manufacturing, and included sal ammoniac, a Chinese discovery. Half a century after his death, Ibn an-Nadim's book The Philosophers Stone (Lapis Philosophorum in Latin) testified to Al-Razi’s interest in alchemy and his strong belief in the possibility of transmutation of lesser metals to silver and gold. Ibn Nadim attributed a series of twelve books on alchemy to al-Razi, plus an additional seven, including his refutation of al-Kindi's (801–873 C.E.) denial of the validity of alchemy. In Sirr al-Asrar (Secret of Secrets) al-Razi gave procedures for coloring a silver object to imitate gold (gold leafing) and the reverse technique to change its color back to silver. He also described the gilding and silvering of other metals (alum, calcium salts, iron, copper, and zinc) and promised that the colors would last for years without tarnishing or changing. Al-Razi was well-acquainted with Aristotle and incorporated some of his theory in his worldview. In philosophy, as in medicine, he believed that the task of the serious student was to elevate himself to a higher intellectual level than his predecessors, eliminating doctrines that were unclear or contradictory, and seeking accuracy and a solid intellectual foundation. Asked if a philosopher can follow a prophetically revealed religion, al-Razi frankly replied, "How can anyone think philosophically while listening to old wives' tales founded on contradictions, which obdurate ignorance, and dogmatism?" Al-Razi did not accept creation ex nihilo, but asserted that God arranged a universe using five pre-existent principles: Creator, spirit (soul), matter, space, and time. Both time and matter had an absolute, eternal form that was not related to motion or place, and a limited form. Unlike Aristotle, al-Razi did not define the existence of time in terms of motion. Space, matter, and time were the components of the natural world. Like Democritus, al-Razi held that matter existed in the form of indivisible and fathomable quanta. There also existed a "void" which was empty of matter. Space was the relationship between the particles of matter and the void surrounding them. An object whose atomic particles were dense was heavier and more solid than an object in which there was a larger proportion of void and fewer particles of matter. Al-Razi’s theory of the soul, explained in The Metaphysics, was derived from Islam. He declared that God, out of pity for the desires of the eternal soul, created a physical playground for it. Once the soul fell into the new realm which God made, it became lost and required a further gift of intellect from God in order to find its way once more to salvation and freedom. This intellect was a grace endowed by God to the soul; once in possession of intellect, the soul was able to reason and discern the relative value of the other four principles: Creator, matter, space, and time. Unlike contemporary Neoplatonic or Aristotelian Islamic philosophers, Al-Razi did not consider the intellect to be eternal. In his Philosophical Biography, al-Razi defended his personal and philosophical lifestyle, emphasizing that, rather than being self-indulgent, man should pursue knowledge, utilize his intellect, and apply justice in his life. According to Al-Razi, "This is what our merciful Creator wants, The One to whom we pray for reward and whose punishment we fear.” Man should be kind, gentle, and just. A person could not escape the fear of death unless he was convinced that his soul would lead a better life after death, and this was possible only through a careful study of religious doctrine. A person who could not believe the religious doctrine but who made a sincere effort would be forgiven by Allah, because Allah did not demand that he do something that he was incapable of achieving. Al-Razi believed that there was a close relationship between spiritual integrity and physical health. Al-Razi’s ideas drew a barrage of criticism from contemporary Islamic theologians and Islamic philosophers, and many fragments of his lost works are preserved in the books that they wrote to refute him. Abu Hatim al-Razi (d. 934), one of the greatest Isma'ili missionaries, published his disagreements with al-Razi in his book A'lam al-Nubuwwah, and preserved al-Razi's thoughts on prophets and religion. Abu al-Qasim al-Balki, chief of the Mu'tazilah of Baghdad (d. 931), wrote many criticisms of al-Razi's works, especially in his book Ilm al-Ilahi, disagreeing with al-Razi’s concept of "time." Shuhaid ibn al-Husain al-Balkhi (d. prior to 940), attacked Al-Razi’s concept of pleasure in Tafdll Ladhdhat al-Nafs, which abu Sulaiman al-Mantiqi al-Sijistani quotes in his work Siwan al-Hikmah. Al-Razi issued a strong defense against his critics in Al Syrat al Falsafiah (The Philosophical Approach). ↑ Hamed Abdel-reheem Ead .Alchemy in Islamic Times, IslamiCity, 10/10/2004 - Education - Article Ref: IC0410-2474. Retrieved October 7, 2008. This is a partial list. For extensive bibliography, see Al-RAZI (Rhazes), Islamic Philosophy Online. Retrieved October 3, 2008. Browne, E. G. 1921. Arabian Medicine. Cambridge, pp. 44–53. Fakhry, Majid. 2004. "Opera Philosophica," A History of Islamic Philosophy, 3rd edition. Columbia University Press. Iqbal, Mohammad. 2005. The Development of Metaphysics in Persia, a Contribution to the History of Muslim Philosophy. Kessinger Publishing. Ranking, G. S. A. 1913. The Life and Works of Rhazes. In Proceedings of the Seventeenth International Congress of Medicine. London, pp. 237–68. Sharif, M. M. 1993. A History of Muslim Philosophy. Kazi Publications Inc.
Stolyarov II, H. 2002. Rhazes: The Thinking Western Physician. The Rational Argumentator VI The Rational Argumentator. Retrieved October 3, 2008. Walker, P. 1992. The Political Implications of al-Razi's Philosophy. In The Political Aspects of Islamic Philosophy, edited by C. Butterworth. Cambridge, MA: Harvard University Press, pp. 61–94. The Alchemy Website, History of Islamic Science. History of "Razi, ibn Zakariya al-"
This page was last modified on 25 June 2015, at 21:29.